Dancers at last year’s Bon Odori. 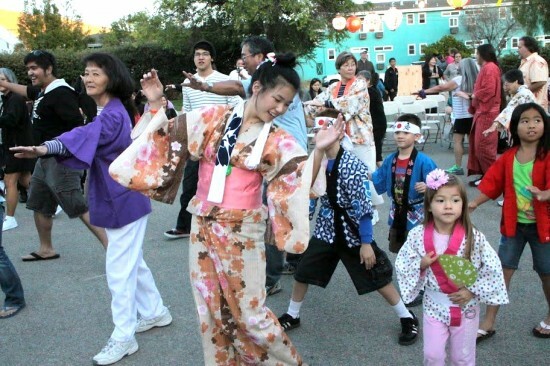 SAN LUIS OBISPO — San Luis Obispo Buddhist Temple will hold its Obon Festival on Saturday, Aug. 3, from1 to 8 p.m. at a new location, St. Patrick’s School, 900 W. Branch St., Arroyo Grande. Help with putting on kimono or yukata will be available from about 3 to 6:15 p.m. in the Faculty Lounge. Those who need to borrow a kimono are asked to call Julie Conaway at (805) 441-5598. Dancers should be dressed and lined up to enter the dance area by 6:30 p.m.
Dance practices at the temple have already concluded, but no experience is necessary — just come and have fun. For more information, call (805) 595-2625 or visit www.slobuddhisttemple.org.